I don't know if this is going to be annual thing, but I thought it would be a bit of fun if I did my own State of the Union post for all my fellow readers. As may of you already know, I no long participate in blog tours posts, such as book spotlights and cover reveals. I was assigned too many of these kinds of posts in 2018, which resulted in my reviews being shoved off of the homepage. Plus, setting up and reformatting all those spotlights was pain in the neck for me. I say, "Good Riddance!" However, don't worry, I'm still going to be signing up for the occasional book blog review tour. Since I don't have to spend time every day working on "spotlights," I'll now have free time to start reading the books in my personal to-be-read pile. I'm finally going to finish reading Outlander by Dina Gabaldon. I had started reading it a few years ago, but I got sidetracked by other books that needed to reviewed and I never got around to finishing it. While my bookmark is still in place, I'll probably start at the very beginning. Then I'm going to read Dragonfly in Amber, Drums of Autumn, Voyager, The Fiery Cross, A Breath of Snow and Ash, An Echo in the Bone, and Written in My own Heart's Blood. My goal is to read all the books before the fifth season of the television series begins. Other books on my reading agenda include: Miss Peregrine's Home For Peculiar Children (a reread), Hollow City, Library of Souls, & A Map of Days by Ransom Riggs; To Kill a Mockingbird (a reread) & Go Set a Watchman by Harper Lee; The Haunting of Hill House by Shirley Jackson (a reread); Mr. Mercedes (a reread), Finders Keepers (a reread), End of the Watch, IT, Pet Sematary, The Shining, Thinner, Insomnia, The Revival, The Outsider, & The Girl Who Loved Tom Gordon by Stephen King; Sleeping Beauties by Stephen and Owen King; and Scary Stories to Tell in the Dark, More Scary Stories to Tell in the Dark, & Scary Stories 3: More Tales to Chill Your Bones by Alan Schwartz. 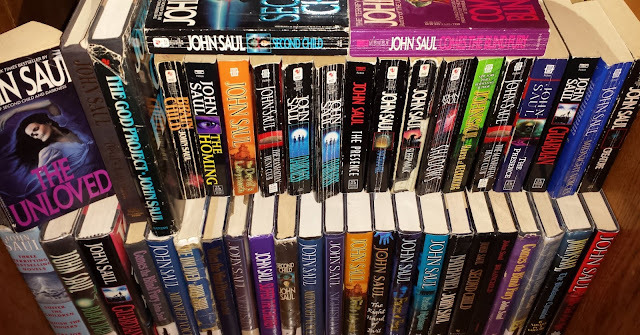 Additionally, I would like to reread a few horror novels by John Saul, such as Comes the Blind Fury, Suffer the Children, Punish the Sinners, and When the Wind Blows. Last year, I had to scramble around to finish all the posts for the ''13 Days of Halloween." This year the event will be retitled to "13 Reads of Horror," and I won't have to worry about sponsors not sending the books or movies to me on time. I already have 2019's Halloween event scheduled with the following books (all of which I already own): Rosemary's Baby by Irvan Levin, The Hellbound Heart by Clive Barker, Psycho by Robert Bloch, Psycho II by Robert Bloch, Psycho House by Robert Bloch, The Other by Thomas Tryon, Ravensridge by Jennifer Hale, The Place by T.M. Wright, Strange Weather by Joe Hill, The Pet by Charles L. Grant, The Bad Place by Dean Koontz, Hell-O-Ween by David Robins, and Halloween II by Jack Martin. These are all of my "must reads" for 2019. I'll also be reading and reviewing many new titles on this blog throughout the year. I like that you have Halloween's reads all figured out already. That Koontz book, can't wait to hear what you think about it! I never did get around to reading Miss Peregrine's, and I wanted to. Maybe this year! For the last few years, I had to scramble to fill in days where sponsors had dropped out. I went through my books and picked out 13 horror reads for this Halloween. 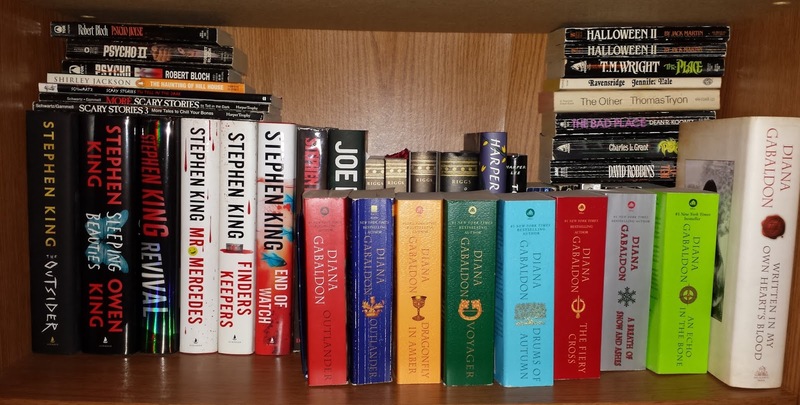 I've only read one Dean Koontz novel - Sole Survivor, but I own many books by him. Ten or more years ago, I remember buying a bunch of 5 cent paperbacks at a thrift store, which many of them were by Dean Koontz, including The Bad Place. I read the first Miss Peregrine's book after I had watched the Tim Burton directed movie. I ended up buying books 2 & 3 shortly after, but I never got around to reading them. Then I bought the 4th book last year.